While not pulling the plug on the controversial devices, a Florida House committee Thursday approved a bill that would place more restrictions on how cities and counties use red-light cameras to police busy intersections. The bill (HB 1061) would prevent using the cameras to cite drivers for improperly turning right on red lights. Also, it would set minimum amounts of time for yellow traffic lights to display and could give drivers more legal tools to fight citations. If they become law, the restrictions would seriously crimp the use of red-light cameras as revenue generators, as is the case in Palm Coast, where up to 52 such cameras are in place–at least for the companies operating the cameras. Palm Coast designed its contract with American Traffic Solutions in such a way as to be guaranteed upwards of $400,000 a year, whether tickets are issued or not. ATS must pay Palm Coast $700 per camera per month. But for the deal to be profitable for ATS, the company must generate well over 5,460 enforceable tickets, since it will cost it 5,460 tickets just to pay Palm Coast’s share (taking into account the $78 per $158 it must also send the state). Many of those tickets are generated by right-turn “violations,” which drivers notoriously contest. Under the state’s red light camera statute, a city or county may issue a notice of violation and a traffic citation for a right-on-red violation unless the motorist makes the right-hand turn in a “careful and prudent manner,” according to a legislative analysis of the proposed bill. However, the red light camera statute does not define what constitutes a “careful and prudent manner,” leaving it to the subjectivity of local enforcers. Though Artiles and local-government groups said they are trying to reach agreement on the bill, the Florida League of Cities and the Florida Police Chiefs Association expressed opposition to the current version. League of Cities lobbyist Casey Cook, for example, said using the cameras to enforce right-on-red violations is important in places such as beach communities, which have large amounts of pedestrian traffic. “We think that is a local decision, and it should stay that way,” Cook said. The bill is slated to go next to the House Appropriations Committee. Sen. Joseph Abruzzo, D-Royal Palm Beach, has filed a similar measure (SB 1342), though it has not been heard in a Senate committee. With red-light cameras popping up at intersections across the state in recent years, the Legislature has repeatedly debated whether to ban or restrict the devices. The cameras take images of vehicles running red lights, a violation that carries a $158 fine. (In the last fiscal year, Palm Coast was one of 71 jurisdictions operating red light cameras in Florida. Collectively, these 71 jurisdictions remitted $51 million to the state, of which $43 million went to the general fund, $6.1 million went to the Department of Health, and $1.9 million went to the Brain & Spinal Cord Injury Trust Fund. So far this year, 77 jurisdictions are operating such cameras. While local governments support the use of the cameras, critics point to issues such as the photographic images not being able to identify the drivers who are running red lights. As a result, notices are sent to the owners of the vehicles — regardless of whether they were actually behind the wheel. Artiles’ bill includes a formula for the minimum amount of time yellow lights would have to display, which could decrease the number of red-light violations. Also, it would make changes in the process used to appeal camera-related citations, such as requiring authentication of evidence in court. Rep. Daphne Campbell, D-Miami, and Rep. Carlos Trujillo, R-Miami, are sponsoring another measure (HB 4011) that would bar local governments from using red-light cameras. That bill also passed the Economic Affairs Committee last month, by a slimmer 10-8 margin. Whenever I come out of Boulder Rock Drive (Home Depot, Shell Station) to Palm Coast Parkway, I turn into Perkin’s parking lot to avoid making a right turn on to Palm Coast Parkway because of the camera. I don’t trust the cameras, and fear being rear-ended there because I come to a complete stop. This often surprises other drivers who slow-roll through the red light as a matter of course. YOU’RE SUPPOSED TO COME TO A FULL STOP. There is an increased chance of being hit in the rear at all these camera intersections because of drivers who jam on their brakes to avoid being snapped by the camera. You may also get a ticket for turning right on the red light, despite having come to a full stop first. I’d like to see the cameras go. So you break the law by cutting through a parking lot???. No wonder theres a million accidents a day in PC,, its because of drivers like this. Does anyone know where Rep. Hutson and Sen. Thrasher stand on this issue? 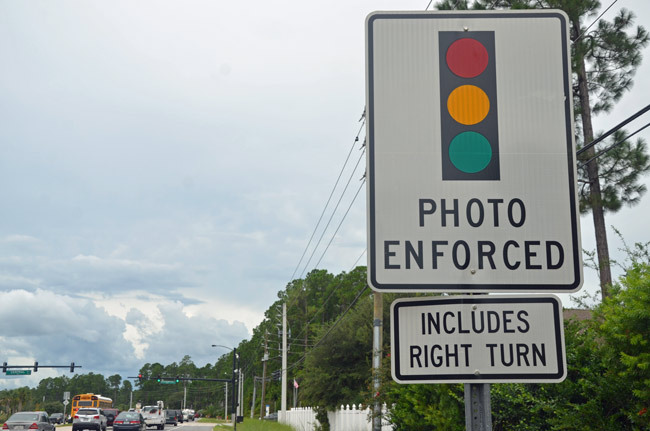 As it appears that a majority of their constituants, at least here in Flagler County and including the Flagler County Board of County Commissioners, oppose Red Light Cameras, it would be interesting to hear if they will represent us appropriately. We all know they spend it before they get it. On this topic, Naples Florida (where the popluation and road conjestion it 1000 times that of little Flagler…. have you ever driven US 41??) is in the process of removing ALL their red light cameras because they do more harm that good. Is anybody listening in Palm Coast??? Thank goodness there’s enough sense left in the Florida legislature for something like this, particularly concerning the whole “right turn” component of this story. The arbitrary nature of “prudence” is not apparent in most pictures, and the city of Palm Coast knows it. I sat at Old Kings Road and Palm Coast Parkway one morning last week. I was facing south, waiting to turn right onto the westbound Parkway lanes. Every single car coming off the northbound intersection of Kings, who stopped and then turned right onto Palm Coast Parkway generated a camera flash. EVERY SINGLE ONE. That tells me one of two things–either their cameras at that intersection don’t work right or else they’re abusing this and sending out tickets, in the hopes that some folks will just pay it. There in lies the problem. The systems themselves are fundamentaly broken. They cannot distinguish between running a red light and turning right. They sense movement and snap pictures. The real problem is the fact that rather than fixing these issues within their software they talk local simple minded politicians into adding a sign to make it no longer their fault that it doesn’t work as intended. The company itself would lose money if they worked properly and they know it. They pay the city so the city sits by idol with their eyes closed. Furthermore they persuade you to not fight it even though you stand a 60% chance of beating it in court by making the fee just low enough that you will choose to pay it rather than gamble with a 40% chance of paying $500 or more in court fees. If everyone drove as they are supposed to, nobody would worry about the cameras. Drive like a normal person, and you won’t get cited. It’s that simple, don’t drive like a jerk. Wrong. I had to defend myself against a redlight ticket in winter park that was for a vehicle that I didn’t own and a tag that “sort of” looked like mine. From the original idea of few major intersections that I welcomed then, to the current abuse of cameras allover the city and for greedy profit today, I agree with Florida legislation against these cameras. City Council over done it! Good !!! this is all a money making scam and most of us know it !! do we really need cameras at some of these locations…like Florida Hospital ??? come on now !!!! there are peole now who are slamming on their brakes when the light turns yellow for fear of getting a ticket…..which now is probably gpoing to cause more rear end crashes…..if Palm Coast really needs money, isnt there other ways to generate it ? I don’t like that the owner of the car gets the citation instead of the driver of the car. I also worry about rear end collisions since many people are stopping on the yellow (at high speeds) because of worrying about getting a ticket. I was SHOCKED when I received a ticket for SUPPOSEDLY going through a red arrow. I know I DID NOT GO THROUGH A RED ARROW but there was a picture of my vehicle going through a red arrow. Something is very fishery about this. I do have Pennsylvania plates on my car….are they ticketing mostly out of state vehicles???? I have been driving fir foutty something years with no tickets… I would like to know what is really going on…Photoshop touch up perhaps! $159.00 ticket is totally ridiculous! Many people that I have talked with from ouside areas avoid Palm Coast now because of the red light cameras. Myself as well I will go to St Augustine to shop rather than drive through Palm Coast. Rather than creating revenue for an outside company, the City, and the state I would rather see more jobs because people wanted to come here and spend money. This is no different than years ago in Starke Fl was the seed trap capital because of the way they chaned the speed limit several times going thru the city. People were warned by travel agencies to avoid that area and they did. We have had code enforcement jammed down our throats quite enough. Time to clean house and get things set up right cause i’m about to leave this City. i’m glad this scam is coming to a halt. at least the florida legislature has some sense. more than i can say for some small towns trying to be big cities. the scam is finally almost over. Why are many of you whining and complaining about these cameras.. If you don’t break the law and run a red light, why worry? I think they have saved lives..
1) Some of us don’t like having big brother watching even when we are behaving legally. We don’t like the precedent that it sets for allowable levels of government intrusion and surveillance in our lives. 2) There is evidence that the cameras actually increase rear-end crashes, and little evidence that they are needed to promote safety at most of the FIFTY-TWO locations that the city has installed them. Seriously, do we have problems with repeated fatal crashes at 52 intersections in this city? If we did there would be a funeral home on every corner! 3) Read Samuel Smith’s post above. Traffic cameras and their operators frequently give false positives and you can find yourself fighting a ticket that isn’t even for your vehicle because someone misread the license plate on a fuzzy picture. This happened to me with an Orlando toll cam (different application, same concept) – I hadn’t been to Orlando in months and even then I hadn’t been on the toll road, and I suddenly got a toll ticket in the mail because someone misread the license plate in a violation photo. I had to spend a bunch of effort fighting it to get them to withdraw it. If actual cops are writing red-light tickets in person, you aren’t going to get a ticket for running a red light in Miami last week when you’ve never been to Miami. I guess Landon and Netts will have to find another lame reason to raise our taxes!!!!!! Driving around town the last month with speed weeks followed closely by bike week, I saw a lot of camera violations in the area around the I-95/Palm Coast Parkway intersection at the busiest times of those events. Most of the violators I saw had out of state plates and were probably here either to eat, get gas or even staying the week in our hotels. How many of those tourists will chose Palm Coast to spend their money in next time they come for a Daytona event after getting their red light ticket in the mail? I’ll bet none. They’ll avoid Palm Coast like the plague. (1)(a) For purposes of administering this section, the department, a county, or a municipality may authorize a traffic infraction enforcement officer under s. 316.640 to issue a traffic citation for a violation of s. 316.074(1) or s. 316.075(1)(c)1. A notice of violation and a traffic citation may not be issued for failure to stop at a red light if the driver is making a right-hand turn in a careful and prudent manner at an intersection where right-hand turns are permissible. This paragraph does not prohibit a review of information from a traffic infraction detector by an authorized employee or agent of the department, a county, or a municipality before issuance of the traffic citation by the traffic infraction enforcement officer. This paragraph does not prohibit the department, a county, or a municipality from issuing notification as provided in paragraph (b) to the registered owner of the motor vehicle involved in the violation of s. 316.074(1) or s. 316.075(1)(c)1. As I see it this high tech scam will be soon gone but in the mean time I have a simple solution. Avoid shopping in Palm Coast. I personally do all my shopping in St Augustine. I avoid Belle Terre and Palm Coast Parkway in favor of US1 and I-95…that’s it. Once election time rolls around I see all the bums being thrown out and the cameras will follow.